Recently, I had some blood work done and to my amazement I'm not as healthy as I thought I was. From the outside I look pretty healthy. To those that don't know me personally, I seem to be pretty much in shape at a healthy weight and no health issues. That darn blood test told me otherwise! While my blood pressure (104/60 is normal for me; the "norm" is 120/80) and glucose levels are pristine- my cholesterol is NOT. I was flabbergasted when I saw the results. 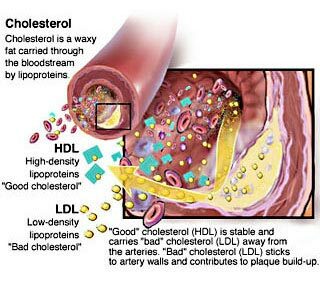 With diabetes, high blood pressure and high cholesterol being best friends with my gene pool, I was disappointed in myself that I've allowed myself to be borderline high/high concerning my cholesterol levels. I admit I have my vices when it comes to food. The Whoppers, China Man (chinese food), KFC, Taco Bell....are among the list. Just typing that out makes my mouth water-but clogging my poor arteries! On top of that while to the outside world I "look" like I'm at a good weight, I'm here to admit I'm more than 50 pounds overweight. When people ask, "how much do you weigh?" and I ask "how much do you think I weigh?" They respond with the weight I SHOULD be at...amazing. My body type is Mesendomorph. This body type tends to be naturally strong but can easily gain fat. This body type also distributes fat evenly throughout the body to give the appearance of not really being overweight. Being overweight on top of this newly discovered neighbor that lives in my arteries is a recipe for heart attack, stroke, diabetes or just an early death. While death in itself doesn't bother me, leaving family and friends behind at a relatively young age does. As a child, I had the best of both worlds- mother's family is from the South so you KNOW that's some good eatin'! Hamhocks, neckbones, pulled pork, red beans and rice, grits, gravy, fried, baked...mmmm. My father is from Dominican Republic so arroz con pollo, casava bread, yucca, penil (roast pork), fried plantains where always fixed and EATEN! Even with those foods we ALWAYS, ALWAYS had fresh fruit and vegetables in my house. My father would go to the fruitstand EVERYDAY (I kid you not) to get fresh produce. My mom kept granola, baby carrots and other healthy snacks in the house. I didn't really start eating junk food until I got to junior high! As I got older, I managed to always eat fruits and vegetables and still do but I haven't been making the greatest food choices overall. So I stepped up big time. I drug out my treadmill, popped my P90x dvd's in the player and got a small notebook to keep notes on my exercise. On top of that, I started taking Vitamin B supplements and purchased fresh blended natural juices from Odwalla, Bolthouse and Naked. I also started buying Healthy Choice and Kashi frozen lunches (make sure you check the sodium on frozen dinners and lunches! Anything past 500mg should NOT go in your cart!). I've imposed a "don't eat pass 8pm NOT MATTER WHAT." I'm already a green tea fanatic so I'll keep drinking that but I've also been using my Hydra Coach! So having pre-purchased meals, fruit and juices not only curb bad food eating but keeps me from eating our all the time, spending money and watch my food intake. As a black woman, I refuse to let my old habits put me in the position to become one of the statistics! Believe me this is not easy by any means. It's easier to go to grab a burger than eat a low carb high protein meal. So I decided to help me stay on track, I'll eat a "reward" meal once every two weeks. This way I don't feel like I "can't" eat this and make me want it even more. It's easy to come home and grab a snack and flop on the couch or the bed and watch television. I set up my treadmill where it's staring me in the face when I walk in the door. I most certainly do not want to have medications be part of my daily diet. Countless family members have a med "cocktail" before even eating breakfast...and I'm NOT trying to go there! Even though I've made a conscious effort to get my cholesterol down to an acceptable number and drop this excess weight, I've also decided seeing a doctor on a regular basis will become part of my regimen. I'm sure there are some of you out there that are like me and only go to the doctor if they are two steps away from seeing the Pearly Gates...lol. I say that in jest but you get what I mean. If it wasn't for this recent blood work I would have continued down that dangerous path playing chicken with my own life. I'm just grateful I caught it in time to make the necessary changes. I encourage you to KNOW your body and KNOW your family medical history. Making changes to be more healthy save not only your life but it also allows those who love you continue to enjoy you that much longer. I felt obligated to share my experience! I hope it shows people being young doesn't necessarily mean you're automatically "healthy." We face the same challenges and health issues just like someone older than ourselves and we can't continue to act like our age will always be on our side. We also can't continue to act like carrying extra unnecessary weight is healthy either. Healthy and weight loss doesn't mean looking anorexic and being a size 0-I think a lot of black women have that stigma engrained in their heads. Being at a healthy weight and eating right to keep things like diabetes and high blood pressure at bay is more important than what size you are at the end.